This section was set up on March 29, 1999. A Winterail tradition continued on March 13, 1999, as fans gathered at Stockton Tower for a few hours before the big California slide show. Many were surprised to discover that the rumors of the tower's demise were, indeed, greatly exaggerated. The tower, however, is now unused and the roof shingles have been removed. Will it still be there for Winterail 2000??? I also shot other rail activity during this week-long trip to California. You can find these photos in the To the Bay and A Day on BART sections. 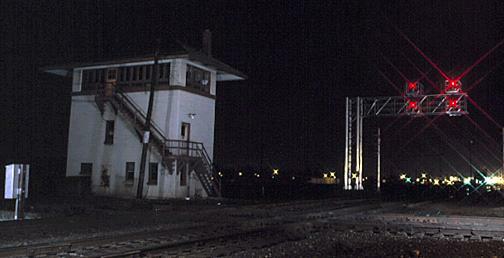 A few nights before Winterail, on March 11, 1999, to be precise, Stockton Tower's lack of lights showed a lack of use. On Winterail Day, March 13th, Union Pacific Dash 8-41CW 9421 led a train over the former Southern Pacific past the tower. Another UP freight, led by Southern Pacific GP40-2 7965, had to hold while a local backed north on the SP to the BNSF (Santa Fe) interchange. SP GP40-2 7653 is in charge of the local. With the local out of the way, the UP freight headed south on the former SP, rattling across the Santa Fe diamond. The Santa Fe also crossed the former Western Pacific at Stockton Tower, about 50 yards to the east. Amtrak Dash 8-P32BWH 2052 rattled across the diamond westbound on the Santa Fe. Joe McMillan captures the action near the tower. 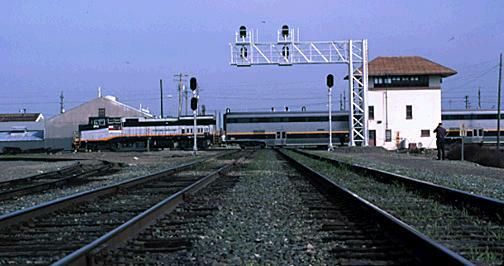 A couple of minutes later, Amtrak F59PHI 459 leads an eastbound on the Santa Fe. 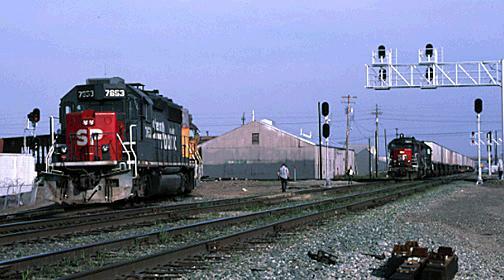 Old and new -- EMD SD70 7001 rattles north past the tower in a UP freight.